The offerings at the Illusion Armoring site certainly look nice. I also seem to recall favorable mention of his Roman Gallic H helm somewhere. Do you have any of his work? And, if so, perhaps you could tell us something about it and post photos? I'm also very interested in hearing any feedback on Illusion Armoring (which should probably be the topic of another thread), particularly this helmet. Too bad Firestryker is still offline. Be interesting to get opinions from some that know regarding quality, accuracy, and construction. Since I know nothing of substance about Armour, its always hard for me to evaluate anything. the helmet mentioned a friend of mine had. it was very heavy (sca helmet) but it looked out of sorts compaired to originals and other reproductions. the lines were "off" that being said on the custom page you can see another friend of mine's gothic suit which is nice. I've got the Elizabethan breast-and-back with tassets from Illusion which I acquired in a trade with a friend. He wasn't happy with the fit, but since I'm smaller than he, I could make it work via some "Old World Craftsmanship". I also had to re-set the attachment rivets for the tassets, as when I reduced the girth of the corselet they hung wrong. Allan Senefelder filled in a strange, deep scoop in the top of the backplate for me, which was perfect for popping the gorget out of; then made me a gorget and pauldrons to complete the set. Now the whole composite armour works quite well together, and in fact I quite successfully jousted in the set yesterday. I would however still like to add sliding gussets to the arm cut-outs of the breastplate, as it doesn't come over far enough (in tandem with my pauldrons) to completely cover my buff-coat., but that would no doubt solve the problem, I should think. One thing Allan said about the breastplate was that with all of the compound curve in it, it ought to be VERY strong. I'm pretty happy with it all in all. I have seen a number of his works but never purchased one myself. I think his armour looks good and is closer to historic pieces out there (the one in the picture looking like the one from churburg with some decoration) than some but weight-wise it should be remembered he makes armour primarily for SCA. This makes your helmets usually of 12-10 gauge (which per a few armets I looked at a few weeks back is not terribly improbable historically). If you want lighter stuff I believe he will do it. Since his move he has not kept up with all the emails and mail with customers but this is the first time I have heard of illusion haivng this issue in the decade I have known of them. Even without the move he is usually quite backlogged and has a long wait (I think I remember at one point hearing he had a two year wait) but in his new place it may perhaps be less of an issue as before he had problems with people around him claiming he was unallowed to work on armour in the place he lived and now he may have more freedom in his work. I've dealt with Illusion for a few years now and have mixed feelings. I ordered their Italian harness and it fits me wonderfully, price, fit and accuracy were much to my pleasure. Ordered a bevor later and the fit was horrible. Sometimes they respond to emails, sometimes they don't. Hard to know what to expect, but I must say that my dealings were overall a success as I'm very proud of the Italian harness. Here is a review for Illusion Armoring from Arador's Review Section. Illusion Armoring offers historical armour and SCA sport plate armour. There is no available information on current waiting time for their armour (6 months has been cited in the past), but delivery of non-in-stock, custom items has occasionally had lapses in accurate scheduling. The armoury has greatly improved on its previous communication issues, becoming more prompt with customer inquiries. Reviews of quality have been mixed, ranging from total happiness in most cases to total disappointment in a few, though recent reviews have been more positive than negative. Illusion's reputation among their customers for their service, reliability, and craftsmanship receives high overall marks. Lebend mit Ehre, Sterben Sie mit Dignität. Gordon, I can gusset the B plate for you, shoot me an email. DONE! Thanks! I shall be happy to oblige, LOL! The feedback I've received has been 60/40, at best 50/50 so I think I'll pass on Illusion Armoring. My first choice for a helmet in this style is Peter Fuller of Medieval Reproductions. However, I thought I'd look around for a cheaper alternative. It's looking more and more like I'll just pony up the funds and go with Peter when the time comes. honestly for sallets. 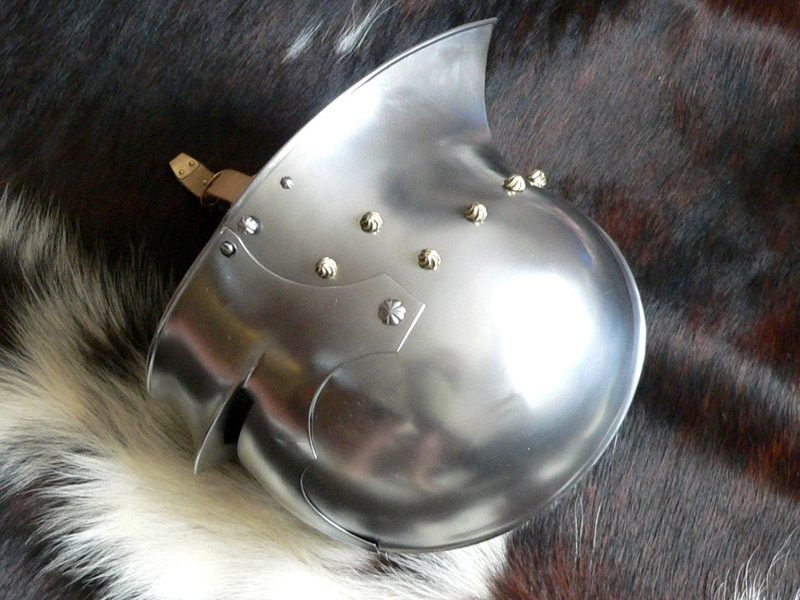 Best Armoury, Armurerie du Duché, Patrick Thaden, Tom Justice, and Jiri (cant remember his last name but he jsut posted a breastplate here) make some of the best sallets i've seen, handled and worn on my head. François L' Archevèque: I saw his German raised Sallet up close and it's top quality work. The thread has contact information and links to Photos of his work. Francois L'Archeveque was the guy who made the exquisite sallets from Armurerie du Duché. He is no longer part of that shop now and work as an independant. It should be interrested to contact him now, his prices had just dropped down. His sallet is really well made for a 400$ one. The shape is great, the weight also. It was a great purchase. Unfortunately I know some people had problems with them. The piece is really well done. Beautiful shape, made of two 16ga pieces welded in the center. The fitting of the visor is extraordinary tight. It was a great purchase for 450$ (in N America and western Europe getting such a great piece will not be under 700$). Business with Arma Bohemia is really easy, the only negative point is that Paypal is not available in Czk Republic. I think you're confusing two armourers. There is a Jiri Klepac (http://www.armour.cz/) whose work has been reviewed on this site. There is also Stanislav Prosek (http://www.mac-armour.cz/) who just posted a breastplate for sale. From the pictures I've seen, both do fine work. ya maybe i did. both do really good work. Anyone have experience with their bascinets? I'd kill (well, not literally) for a good cheap one, and Illusion offers 12 ga, which I haven't seen anywhere else. Take your time, raise the funds and get a great one. You will not have to change in 3 years, it wil be a lifetime purchase. With a great armourer you'll have service, they have the way to take care of you, and make you 100% satisfied.